Domestic grey cats are often mistaken for this breed. Russian Blue cats have green eyes (not yellow, blue, or orange but a dark bottle green). Solid blue all over with just the tips of the guard hairs being silver and producing a shimmering effect. A thick double coat. The first coat consists of the longer guard hairs. 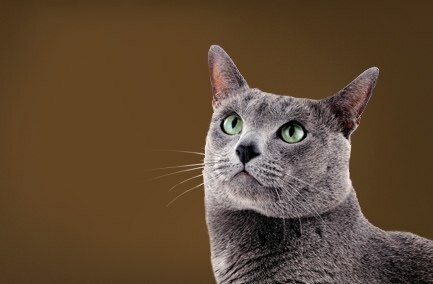 The second is the undercoat, which is very soft and gives the Russian Blue coat its unique feel. Mauve footpads. Most domestic blue cats have slate gray pads. Their blue coat and green eyes are unique to Blues. They have a higher than typical incidence of kidney and bladder problems.